The camera captured a wide shot of Bolshoy Moskvoretsky Bridge, near the Kremlin, where the crime took place. The quality of the footage is only good enough to distinguish the cars on the bridge and the figures of people moving along it. According to the video, the politician was gunned down at 23:31 Moscow time by a killer who was allegedly waiting for him on the stairs of the bridge. The murder happened when Nemtsov and his companion – a woman in a white coat, allegedly Ukrainian model Anna Duritskaya – were covered from the camera by a snow-clearing vehicle passing by. The alleged killer then ran towards a car which was stopped on the bridge several meters away. He got into the passenger's seat, and the vehicle drove off. 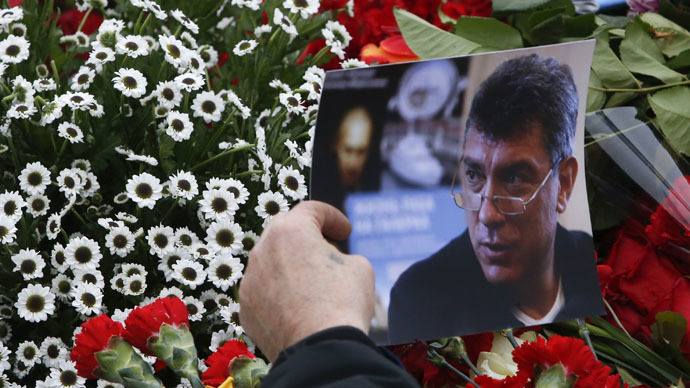 A witness to Nemtsov’s murder has described the killer to police. “We are looking for a man 170-175 cm (5 foot, 7 inches) high, of regular physique, dark cropped hair. He was wearing blue jeans and a brown sweater,” a police source told LifeNews. The same source said the car the killer used was a silver-colored VAZ-21102, with North Ossetia number plates. LifeNews also obtained footage showing Nemtsov and Duritskaya arriving separately at GUM department store facing Red Square at around 22:00 MSK. The pair apparently had dinner at one of GUM’s restaurants and then decided to walk to the politician’s nearby apartment – the path of which required a walk across Bolshoy Moskvoretsky Bridge. At the moment, investigators are looking into five possible motives behind Nemtsov’s assassination. According to Vladimir Markin, spokesman for the Investigative Committee, the murder could have been a provocation to destabilize the political situation in Russia. It could also be linked to threats Nemtsov received over his stance on the Charlie Hebdo attack in Paris or the current war in Ukraine. The politician’s business activities and a possible assault related to his personal life are also being looked into. Nemtsov, 55, gained popularity as governor of Nizhny Novgorod region from 1991-1997. He also served as energy minister and deputy prime minister under former President Boris Yeltsin. After 1998 he participated in the creation of several liberal movements and parties, serving as a member of parliament. Since 2012, he had co-chaired the liberal party RPR-PARNAS (Republican Party of Russia – People's Freedom Party), being more involved in business than politics. Nemtsov’s murder has been condemned around the globe, with US President Barack Obama, and German Chancellor Angela Merkel urging a thorough investigation of the crime.